This article requires the Gravity Forms Media Library perk. Buy Gravity Perks today to get this perk plus 30 other galatic Gravity Forms plugins! GP Media Library enhances Gravity Forms to allow automatically importing files and images to the WordPress Media Library when you submit the form. In this tutorial, we will show you how to use GP Media Library to map a submitted file or image to an Advanced Custom Fields (ACF) custom field. 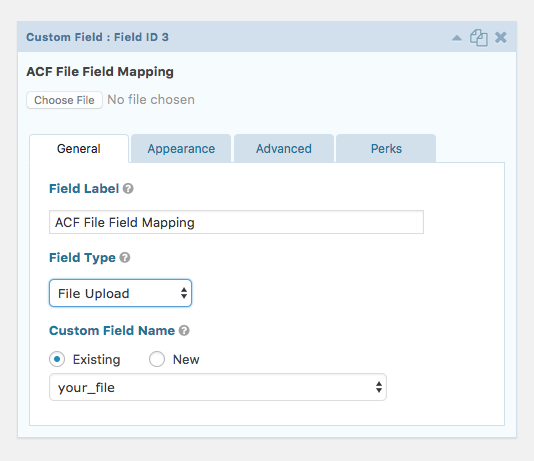 The first thing we will do is visit the ACF Field Groups page and add an Image or File custom field. Next, we will visit our Gravity Form and add a Custom Field to our form from the Post Fields section. Now let’s open the Custom Field field, locate the Field Type setting, select “File Upload” from the drop down. Locate the Custom Field Name setting. If you’ve just created the ACF field (like we did in this tutorial), select “New” and enter the name of your ACF field. If you’re using an existing ACF field, selected “Existing” and select the field name from the drop down that appears. 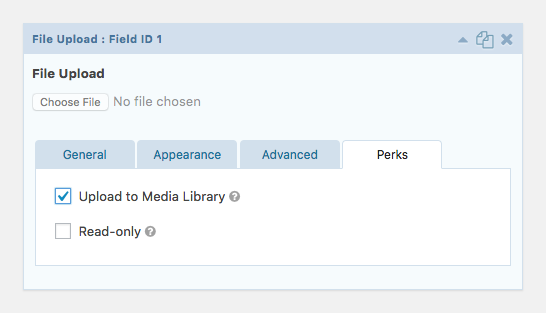 Lastly, select the “Perks” tab at the top of the field and select the “Upload to Media Library” option. All set! 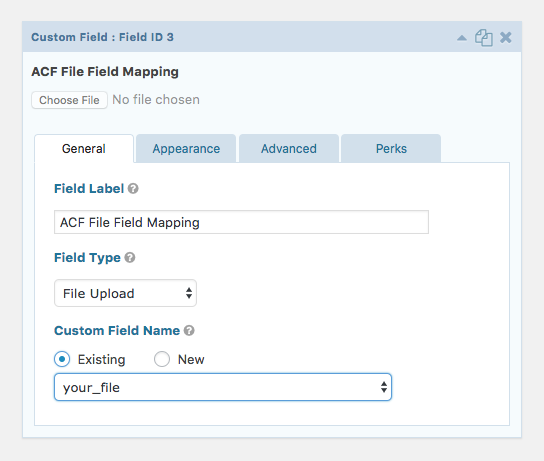 Now, when the form is submitted, the file/image uploaded in this field will automatically be imported into the Media Library and mapped to the ACF custom field. Working with ACF Gallery fields? Good news! 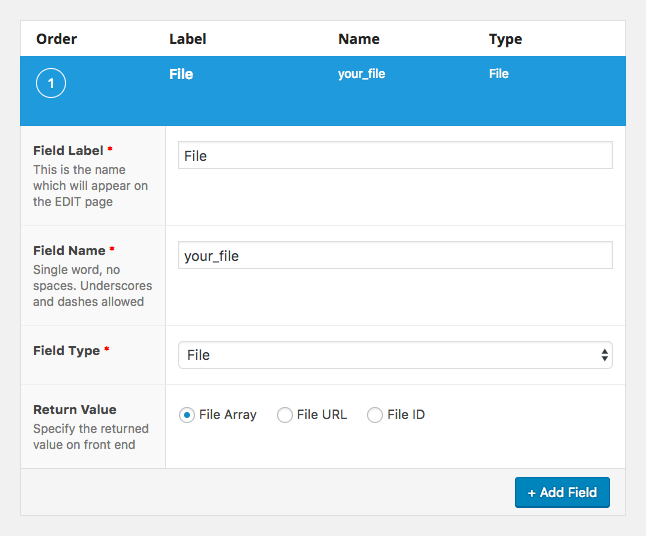 This plugin also supports mapping Gravity Forms Multi-file Upload fields to ACF Gallery fields. Did this help you out? Let us know in the comments below! Is it possible to show the uploaded thumbnails directly below the upload field instead of image file name? Is this something we could achieve with an HTML field and the merge tags or do they not work until after post submission? Would this be JS? Hi Leland, we don’t have a solution for this one. I’ve sorted it out with some expert help from Codeable. Thanks for providing a great resource to the community. I guess this doesn’t work with image files within repeater field or gallery? I would need to have multiple images on the form. First off, thanks for your hard work on the Perks set of plugins, nice job. We are attempting to connect an Custom Field to an ACF file field and we’re not seeing any ACF fields appear in the Custom Field Name drop-down. Could we be missing a perks plugin? We determined that the issue had to do with the fact that the field was never used in a Post. The issue is it had been used for a User, so that part seems like a bug with the Gravity Forms plugin itself. However, once we were able to get it connected we also found that the image was not added to the Users associated ACF field. Does this not work with ACF fields that are associated with Users? 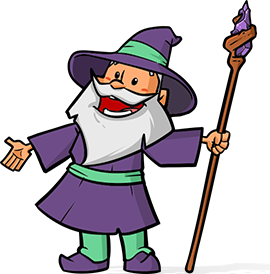 Hey Kristopher, we’ll be happy to help via support. ? I know you answer a similar question in a previous comment but I just want to be sure GP works for my case before I buy it. I’m using GF to create users and update their profiles. In my “Update your profile” form, I have a picture profile upload field (image) and I manage that field with ACF in the backend of WP (native WP users). 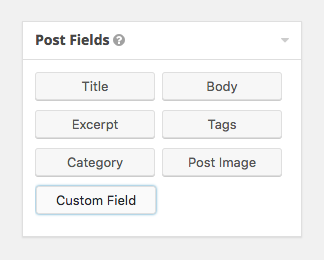 In your tutorial, you said to create a Custom field in GF but because it’s a profile update form (and not a form to create a post), is it still a Custom field? Because with the User registration GF add-on, you have to map the fields in the settings and not with Custom field like we would do normally. Would this work for uploading an avatar to a user profile? …Error message. Works fine under HTTP. Any thoughts on this? 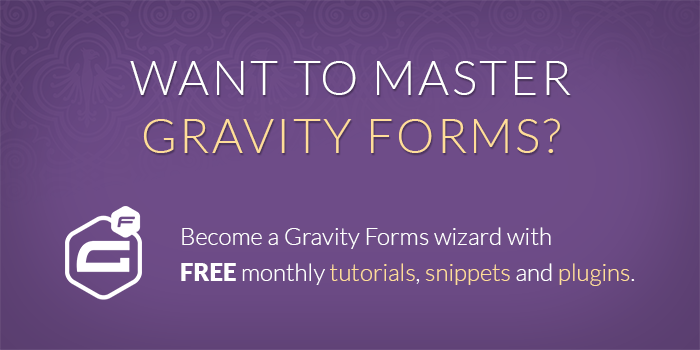 Are you using Gravity Forms Media Library? If so, we’ll be happy to help you via support. Hi Pieter, we’ll reply to your support request. This will probably need a little custom code to fill the gap. So is possible to show thumbnails in front-end with all images the user uploaded instead plain-text? It requires ACF or there’re another way to do this? Could we populate all the ACF fields via GF, any code snipped to do so? Hi Ladislav, possibly. It would probably require a small amount of customization. Drop me a line (david at gravitywiz dot com) and let me know how you’re using Pods currently and how this would fit in with that. Drop us a line via the support form and we’ll be happy to help!